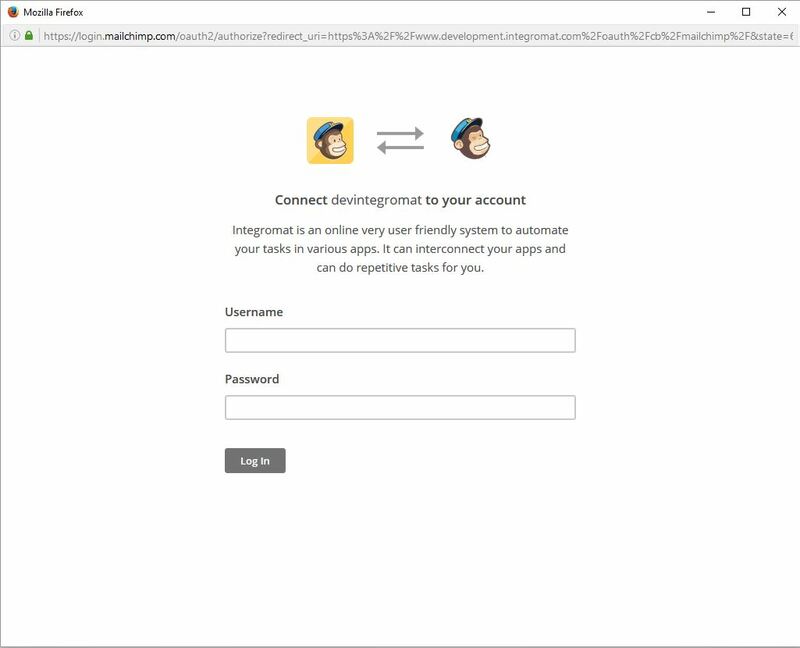 For most apps, it is necessary to create a connection, through which Integromat will communicate with the given third-party service according to the settings of a specific scenario. If you, for example, want to create a scenario in which you intend to work with your Facebook posts, you must grant access permission to Integromat for your Facebook profile. To create a connection, go to the module settings panel. If a given module requires a connection to a service, the Connection will be shown as the first option. You can either select one of the connections created earlier or create a new one. If you want to create a new connection, click the Add button next to the Connection box. This will bring up a panel for setting up the connection, showing a default connection name. You can change it if you want. For some connections, you may also wish to check the Show advanced settingsoption and fill in additional fields which will appear. Click on the Continue button. 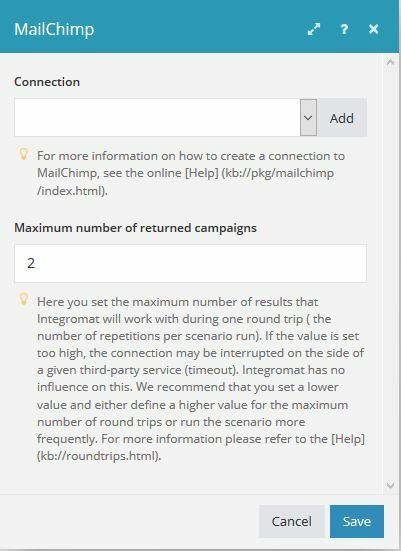 While creating a connection to most third party services, Integromat will redirect you to their respective web page where you will be prompted to grant Integromat access to your data. If everything went right, the connection is successfully established and set up. For every connection, Integromat requires only those access rights that are necessary to successfully complete a given scenario. It means that, if you, for example, create a scenario that will download posts from Facebook, Integromat will not ask for permission to post them. Unfortunately, not all services allow you to limit access to only specific tasks. Therefore, Integromat must require full access rights. For more information on how to restrict Integromat access to your account registered to those services, see the application-specific documentation. Personal data security is Integromat's top priority. For detailed information on how data is secured and protected in Integromat, click here. 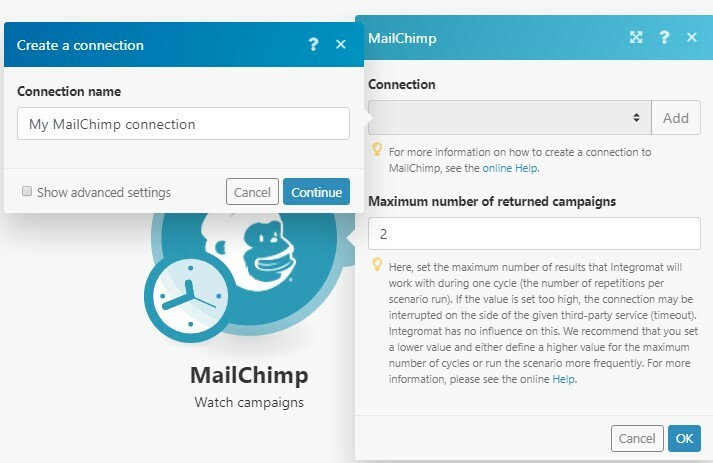 All connections can be administrated from one place in the Connections section. 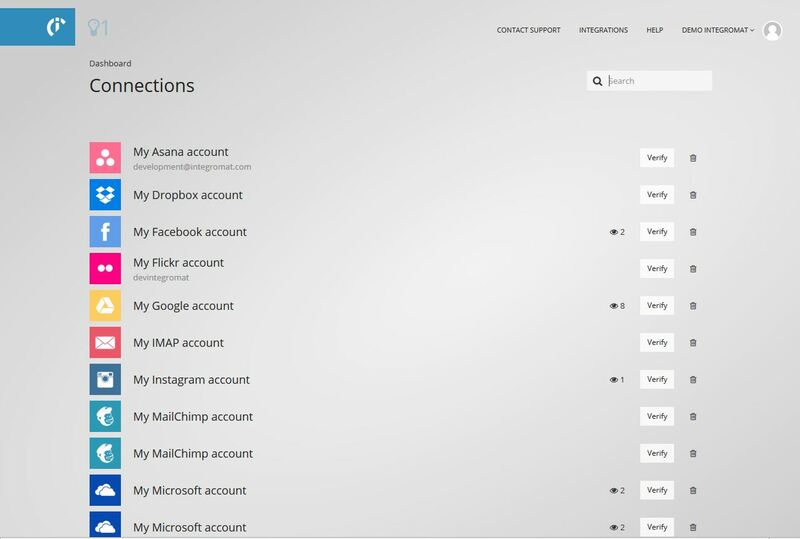 Here you can see which permissions were given to Integromat for each connection and rename, reauthorize or delete existing connections. Clicking the Verify button will check if the connection to the service was established successfully. Integromat usually obtains access rights to a given service for an unlimited period of time. However, this is not always the case. With some services, the access permission must be renewed after a certain period of time. 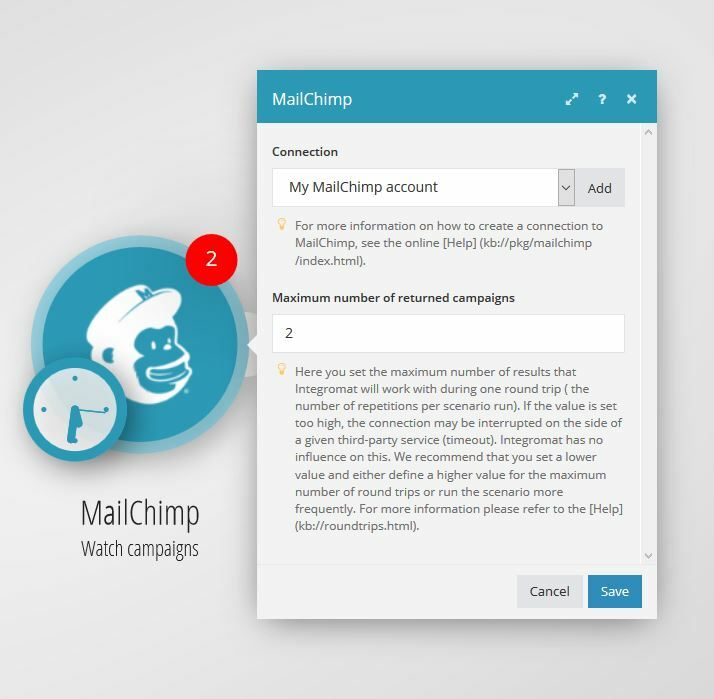 In these cases, Integromat will notify you via email shortly before its access rights expire. In order to renew a connection, click the Reauthorize button in the Connections section.